Most online backup services are relatively similar: they allow you to back up your files on your hard drive in case of total data loss. These services come with various features and customer support options. Additionally, pricing varies by a few dollars per month. However, in reality, all essentially offer the same thing to potential customers. So when we stumbles across UpSafe and saw the uniqueness of their service, we were blown away. UpSafe is an alternative backup solution based out of Boston, Massachusetts, and is not your typical online backup provider. With UpSafe, you don’t back up individual files and folders. Rather, they enable you to back up your Gmail, Google Apps or Office 365 accounts…for free! For those of you who still do not understand the genius behind this, allow us to explain below. We all are used to think of Google and MS Office 365 to be safe and stable. But there is slight protection against user error or hacker attack. Upsafe is designed to protect the companies from above mentioned issues by offering secure and reliable backup service. 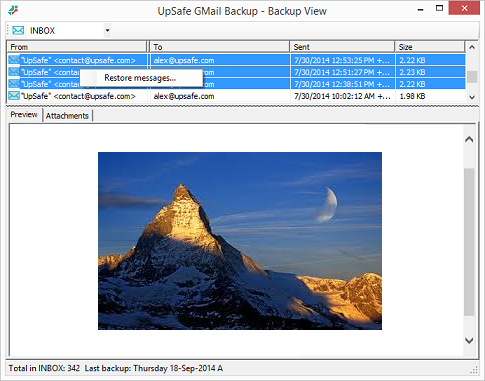 UpSafe is currently running their service in BETA version, however it performs flawlessly. Even with services like JustCloud, which is extremely user friendly, none compete with the user experience of UpSafe. In fact, user friendliness may be the highlight of UpSafe’s service. Simply download the software from their website and within minutes you can back up your Gmail, Google Apps or Office365 (or all of them). After following a few prompts and straightforward instructions, you get to their intuitive interface which allows for easy restoration with a few clicks of the mouse. If you were to look through our list of online backup services, you will see that each one has a set monthly fee. Even JustCloud, which offers a free version, is only for a limited time. Free versions, like the one that JustCloud and SpiderOak uses, are meant to entice customers to upgrade to a paid account. UpSafe, though, is free to use. There is a (very) small catch: no business can operate for free. Not even Google. UpSafe will continue to offer parts of its service for free, however they will eventually move to paid plans. Therefore, we strongly recommend signing up today to enjoy the full list of features absolutely free. Like any major online backup provider, UpSafe uses Secure Socket Layer (SSL) technology to encrypt your information. It is contained behind secured networks, which is only accessible by a select number of UpSafe IT personnel. These people are required, by law, to keep your data confidential and out of the hands of third parties. Moreover, as per their website, “all transactions are processed through a gateway provider and are not stored or processed” on their servers. Customer data is encrypted by unique customer owned keys with AES256 standard security algorithm. The data is safely stored on the Amazon S3 cloud and replicated across multiple independent nodes. 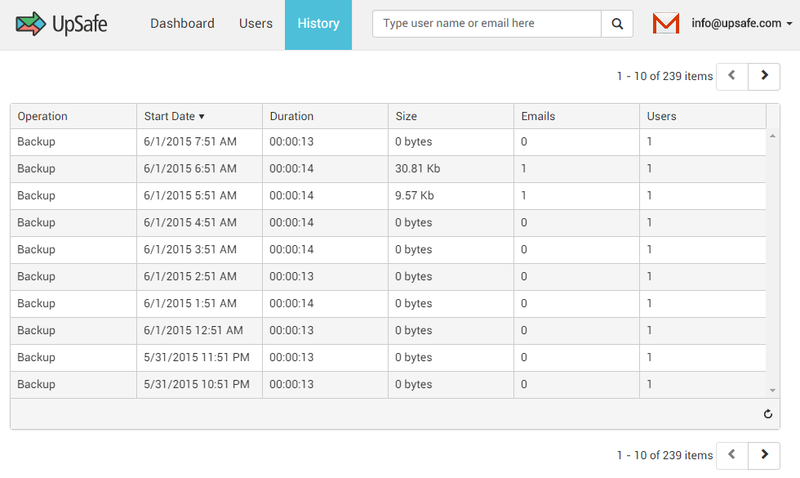 The fact that UpSafe is in BETA mode may have potential users worried. We would generally understand this, however there is no merit to this. The only downside we see to UpSafe is that they offer email support only. No phone or live chat options are available. However, after closer review, you will receive a reply within 24 hours. This is standard for all services in the backup industry. UpSafe is, without a doubt, a service you should not only not overlook but test out. If you have files or folders that need to be backed up, put them in your Gmail account and you can back up all or selected data without a problem. With a range of standard backup features, excellent usability and solid customer support and security, UpSafe is a service we strongly recommend to anyone in need of data backup. More importantly, you have nothing to lose. The service is completely free, though this will change in the future. So don’t delay – try out this fantastic service today!